Great views of the Tarangire River. Good value option with a range of accommodation. A relatively short drive from Arusha. Tarangire Safari Lodge is on top of a high bluff with a breathtaking view of the Tarangire River below, which attracts impressive numbers and variety of game, allowing guests to appreciate Tarangire's diverse wildlife from the comfort of the lodge. 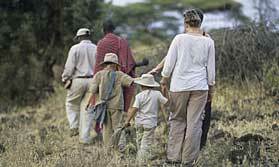 Game viewing is excellent all year round in Tarangire. Accommodation at in 35 twin tents & 5 bungalows. Tents are basic but comfortable; built on a solid base, with a thatched roof, screened windows, a writing table and chairs, electric light and en suite bathroom with solar-heated shower and flush toilet. Each tent has a small veranda. The bungalows also have en-suite shower rooms and verandas and can accommodate up to 3 adult or 2 adults and 2 small children, so are good for family groups. There is limited electricity in the morning and evening. The lounge and dining areas have high thatched roofs, with open sides that offer uninterrupted views of the landscape and wildlife. The cuisine is international, using fresh local ingredients and a hint of African spices. The lounge area has oversized armchairs made from old Zanzibari dhows, a perfect place to relax. During the day guests can cool off with a swim in the pool, enjoy a bird walk around the lodge grounds or look for souvenirs in the boutique. Open: Tarangire Safari Lodge is open all year. Location: The lodge is on a tall bluff overlooking the Tarangire River inside Tarangire National Park. It is 125km southwest of Arusha, about a 2 hour drive. Rooms: There are both tents and bungalows, 40 in total. Tents stand on a solid base and have a thatched roof, gauze windows and a veranda at the front. The en-suite shower rooms have solar heated water. The 5 bungalows are built in traditional Maasai style. They are circular, with thick walls, large windows and thatched roofs. Beds have mosquito nets. As with the tents, the en-suite shower rooms have solar-heated water. The bungalows can accommodate 3 people. Power is provided between the hours of 6 and 10 in the morning and 6 and 11 in the evening. Activities: Wildlife viewing is based on game drives, night drives and guided bush walks. Guests can go on bird watching walks in the lodge grounds. Facilities: The lodge has an open-sided dining room where generous buffet-style meals and 3-course dinners are served. The lounge and bar has comfy sofas and coffee tables where guests can read, chat and enjoy a drink in comfort. The ‘secret sundowner’ service provides free snacks between 6 and 7 each evening. Free tea and coffee are available all day. There is an outdoor pool. In the bar there is a charging facility for recharging camera batteries. The Baobab Boutique stocks gifts and textiles. Children: Children of all ages are welcome, though there is a minimum age limit of 12 on night drives and 16 on guided walks. There is a paddling pool for children and early dinners can be arranged. Communication: There is Wi-Fi internet access in the lounge, to be paid for locally.